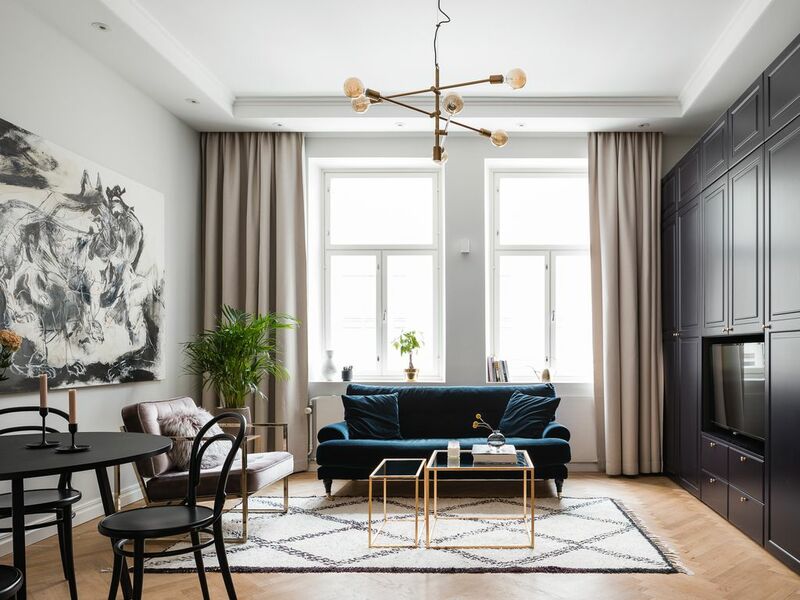 For you who aren't satisfied with middle of the road accommodations, this apartment in the heart of Helsinki is newly renovated with all the latest amenities and accoutrements. The building itself is historically valuable and exudes a warm glow of authenticity, making it a perfect place from which to enjoy all that Helsinki has to offer. Late check-in after 9:00 p.m. 20€ and after midnight 40€. The apartment itself has a double bed (Murphy bed) in the living room and, above the kitchen, there’s a loft with two single beds (close to each other, see picture). The bathroom is relatively small but, with the exception of holding family meetings there, it should suffice. I will be reachable throughout your stay, and am happy to help in any way I can. You will be located a few blocks away from the sea, in the very centre of Helsinki. By taking a very short stroll along the peaceful streets (1 min), you will find Hietalahti market hall and square. The hall features a variety of cosy and traditional restaurants and the best burgers in town courtesy of Roslund’s butcher shop. Everything else in Helsinki is about a 5-10 minutes’ walk away (Helsinki is truly that small!). Close nearby you will also find two tram lines (the 6 and 9), an underground subway station (Kamppi) and bus services, all able to carry you on your adventures wherever they may take you. It is strictly prohibited to bring to the apartment persons other than the stated guests. A friend and I stayed at the apartment recently. Joachim was great to work with and helpful. The apartment was gorgeous and in a great location, we walked everywhere except when it was raining. There are restaurants and a grocery store right close by. Transportation to and from the airport was quick and easy via taxi as well. I would not hesitate to stay here again. We really enjoyed our stay here. You will have everything you need from grocery stores, restaurants, and public transportation. There is plenty of room for two and great storage so you don’t feel like you’re living out of your suitcase. The only thing I’d want is either an extra towel or bath mat because the bathroom is small and the floor gets wet from the shower. I would recommend staying here and walk everywhere to take in the sights of Helsinki. We chose this place for the location and couldn't have been happier. The apartment was charming, modern, and CLEAN, which we very much appreciated. There was the ability to sleep in the loft, which we opted to do, leaving so much more room in the main level. The convenience of having a washer/dryer was a nice surprise after a week of traveling, and the kitchen was stocked with all of the necessities you could need. Overall, we were very satisfied with this VRBO, and would recommend it to others! Our flight into Helsinki was badly delayed -- The owner could not have been more helpful in his flexibility in meeting us and introducing us to the property. The apartment itself is both stylish and comfortable. The owner's information about local shops and eateries very helpful.